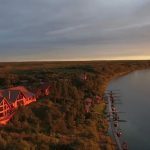 Although we believe Bristol Bay Lodge to be among the finest, if not the finest, Alaskan lodges, there is no question that is a claim that could be made by others. 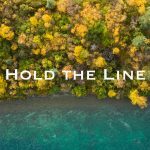 Equally, there can be no argument that Alaska has some of the finest and most productive fishing on the planet; we are lucky enough to enjoy a piece of it. Where we are totally unique is in providing the opportunity for our guests to enjoy two intimate, comfortable (recently upgraded) outpost camps on what amounts to very rare private water. Imagine just four guests, or six from time to time if an intact group, enjoying the comfort of a private camp on private water with incredible fishing. You can fish all night under the midnight sun or just enjoy sitting around the campfire in the middle of nowhere but with a full staff and full communications in case of emergency. 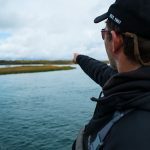 It does not get better than this and this is what Bristol Bay Lodge, with its international experience in remote operations, do best. Guests fish other rivers during the day, rotate into one of the outpost camps at about 5 pm, spend 24 hours there, then return to the lodge the following evening. 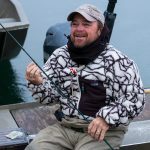 To describe these outpost camps as just “great fishing” would be to ignore what is possibly the best overall wilderness experience in Alaska today. Picture yourself witnessing phenomenal scenery and wildlife below as you come in to land on the pond that services the camp facilities. Once landed, your guides will take hold of the airplane’s guide ropes and smoothly tail it up on shore. You unload and spend a few minutes chatting with the outgoing group about the spectacular fishing they have experienced just that day. You take a moment to look around at the stunning beauty and the serenity inherent in all of remote Alaska, then continue to the camp thinking about the amazing fishing you have already experienced that day while day dreaming about the fishing to come. You turn just in time to see the pilot lift off the water, bank and turn away from you and across a cloudless blue sky; the smile on your face is one of anticipation. You arrive at the intimate camp perched on the banks of the river and begin to chat with the guides who already are planning your next fishing adventure. Both camps have fixed beds with fresh linens warm full sized sleeping bags, fleece liners, heaters, running water, and full service lavatory. Each camp also has three guests tents that accommodate two fishermen per tent, as well as a main cook tent that is used for serving breakfast and dinner plus a central meeting place for sharing fishing stories, often filled the scene of laughter well into the night. Both camps are staffed with two experienced guides as well as a camp chef to take care of all of your needs. Each of the camps has a unique charm and distinctly different types of fishing but both are equipped with heated ‘Weatherport’ tents built on stable wooden platforms. With fully framed beds, proper mattresses, high-quality sleeping bags with sheet liners and fleece blankets, high-quality pillows and linens, the nights are cozy, warm and comfortable. The dining tents are spacious (for pre-dinner gathering, after-dinner fly tying or cards) and contain all necessities for the preparation of hearty meals. There is also a hot-water shower and flush WC facility. 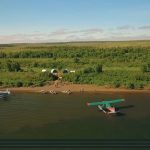 Each camp has its own boats and motors and radio and satellite communication as well as a fully experienced resident staff of two guides and a chef. Both camps have and will be visited by all guests each week. Waterproof bags will be provided to guests to use for the week for storage while traveling to our day and overnight excursions.